Indeed, only four books made the cut. But that’s okay, because that means I didn’t have to haul 20 books out to the hotel and waste my time previewing them today! Instead I have four books I know I want to read! There’s a good mix here, plus I have some audiobooks on standby waiting for me when my eyes wear out. So let’s get going! Let me welcome all my fellow ‘thoners to the blog, and wave hellos to regular readers and the amazing people choosing to be cheerleaders! All updates will be kept on this post so that no feed readers shall explode. Thank you in advance to the lovely folks running this show. Y’all are awesome! 7:00 am – It was an excellent night of sleep so I’m totally ready to go. I have my first cup of coffee in hand, and I’m starting with Big Little Lies. Have fun everyone, and we’re off! 9:00 am – Book – check. Breakfast – check. (And thank goodness for bringing my own food from home because hotel breakfast? No thank you!) Coffee – check. Exercise – check. Off to a good start here. Loving Big Little Lies so far. The reading isn’t going fast, but I’m having a fun time checking in with friends and playing on Instagram and generally spreading my attention around this Readathon. 11:00 am – The only problem with hotels is never knowing when housekeeping will come by. I spent about an hour reading in the lobby only to have someone knock on my door fifteen minutes after I finally came back. Sigh. I told them I’d be out after noon. That’ll be time to head to the coffee shop and library! Big Little Lies is still in progress and I’m loving every page. Hopefully by the time I next update – likely midafternoon, since I’ll be out for awhile – I’ll have finished this one and be starting my next. 2:00 pm – Coffee shop break was nice and relaxing. Almost to the end of Big Little Lies. 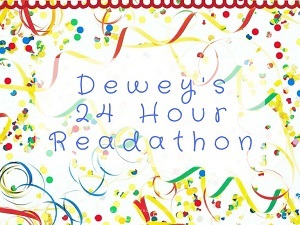 I don’t think I’ll get a whole lot read this Readathon, but I’m certainly enjoying my time! 4:00 pm – Well, the slump has hit. I’m not sure if it’s the mid-afternoon blahs, or that I really enjoyed Big Little Lies a lot, but there’s a part of me that simply wants to say okay, I’m done, time to nap. I read a bit of the beginning of two other books, and listened to a bit of audio, but nothing is really catching my attention, so I’ve set all those aside for now. I’ve got one book left to try before digging into my iPad for ebooks or into my backlog of audios. I might take a bit of a break first though before getting to it. And if this is the extent of my Readathon this time? I’m okay with that. 6:00 pm – Found a hit in the week’s Sync YA title, The Dead House. The audio is fascinating. I’m off to have dinner with my family, but hope to finish the audiobook tonight! 9:00 pm – Well, I’m going to fall asleep before this audiobook is over, but I made a good run of things. This will likely be my last update. I’ll keep listening until I’m too tired to go on. Heh. See y’all tomorrow! 7:00 am – Now, waking up at 6:30 after only a few hours of sleep is a bit cruel. Ah well. I’m updating my stats and mini-challenges below. It’s too early for anything but coffee right now. While I only finished a book and half an audio, I’m very happy with the way this ‘thon turned out. I had a blast, especially with the instagram challenge and my lovely hotel! Hope the rest of you had a wonderful time as well. Seeya in October! 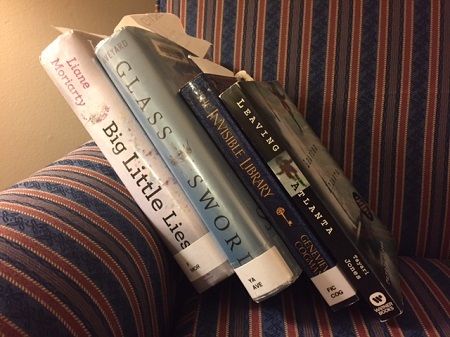 Big Little Lies, which is odd because it’s the one I’m least sure I’ll finish. I have a feeling it’s going to be a love it or hate it book. I’m going to start with it though. I’m a writer and stay-at-home mom to three teen boys. For the last few years, I’ve lived a ridiculously nomadic life, and I look forward to the day I can return to my home in San Antonio and settle back into my real life again. Sadly, I was unable to participate this past time, but I’ve participated in many since my first in April 2009. This time, I plan to take more social breaks to do mini-challenges and cheer my friends. Instagram Challenge: For this ongoing challenge, please see my instagram feed. No need to cross-post all those pictures here! I’m really enjoying Dead House and hope to finish it before I get too sleepy. Not really, unless you count the discovery that I just wasn’t into the other books I brought to the hotel with me. I’ll read them later, but just not today. Glad I found one to get into though! Apparently, other than surveys and the Instagram challenge, I haven’t been much interested in mini-challenges. That’s new. The Dead House on audio kept me up much later than I usually would have gone! Nope! I liked the simplified format. 5 and 6. How many books did you read? What were the names of the books you read? I finished Big Little Lies and half the audio for The Dead House. I tried and put aside three other books that didn’t end up good RaT fits for me as well. 7 and 8. Which book did you enjoy most? Which did you enjoy least? Big Little Lies the most. But both were good. I’ll definitely participate again. Aprils are always easier for me since October is usually around my son’s birthday weekend. Regardless, I’ve been doing this for eight years now and I’m sure there will be plenty of ‘thons in the future! Maybe one of these days I’ll switch it up and join a non-reader role! I love that you go to a hotel. I want to do that one of these years. I’m working all day today so no readathon for me but I wish you lots of luck! It was REALLY nice, especially with the house under major remodel and without water/sewer most of the day, haha. You’ve been making great progress so far, Amanda! Keep up the great work and happy reading!